The original oatmilk company from Sweden. 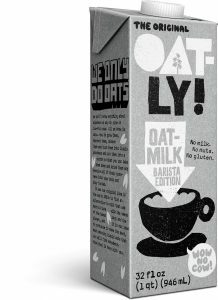 Oatly was founded back in the 1990s and is based on Swedish research from Lund University. The company’s patented enzyme technology copies nature’s own process and turns fiber rich oats into nutritional liquid food that is perfectly designed for humans. Oatly’s sole purpose as a company is to make it easy for people to turn what they eat and drink into personal moments of healthy joy without recklessly taxing the planet’s resources in the process. No milk. No nuts. No gluten. No GMOs. Just delicious oatmilk.